Order now and receive free freight! Every CONFAST® Hex Head Sleeve Anchor is in stock for immediate shipping. The CONFAST® Hex Head Sleeve Anchor is designed for use in a wide variety of masonry base materials, such as brick, block, and concrete. Each CONFAST® Hex Head Sleeve Anchor is completely assembled with the hex nut and washer attached. The hex nut is responsible for the name of this CONFAST® Hex Head Sleeve Anchor. 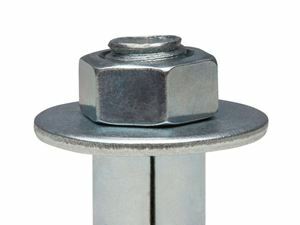 The hex nut is slightly smaller than the designated diameter of the CONFAST® Hex Head Sleeve Anchor and corresponds with the diameter of the stud inside the sleeve. For example, a 3/8" CONFAST® Hex Head Sleeve Anchor has a 5/16" stud and utilizes a 5/16" nut. Manufactured in diameters of 5/16", 3/8", 1/2", 5/8" and 3/4"
Product List - click on any item listed and go directly to the specific product page. Every page will provide in-depth information describing the product.